Central Asia’s top producing gold mine Kumtor is back in the spotlight, after its major shareholder, Canadian company Centerra Gold’s environmental record was questioned by the Kyrgyz public, domestic activists, and international experts. The controversy surrounding Kumtor has translated into a highly politicized backlash in Kyrgyzstan over a lack of transparency and Centerra’s unwillingness to disclose information on the harmful effect of the mining operations on glaciers. In light of the growing public pressure on Centerra Gold in the republic, one of the Kumtor project’s creditors, the European Bank for Reconstruction and Development (EBRD), has come under scrutiny. 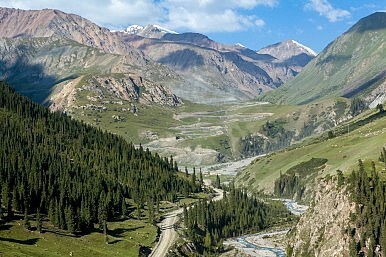 However, a recent investigative report on Kumtor by the Asia Times has revealed severe irregularities regarding the environmental impact of the gold mining on the Davydov and Lysyi glaciers that also feed into Central Asia’s trans-boundary water resources, the Naryn and Syrdarya rivers. Preliminary findings indicated that Centerra has been operating the mine without a permit for waste disposal from the Kyrgyz authorities, evidently until 2012. The company’s record in the Kyrgyz Republic begs the question of whether the EBRD ignored its own environmental standards regarding the Kumtor project. Additionally, the Bank’s due diligence has been cast into doubt after it became apparent that Centerra was in breach of Central Asia’s 1992 water accord. Concurrently, Centerra has failed to make public a full report on the status of the damage to the Davydov and Lysyi glaciers. This contravenes the Aarhus Convention’s requirement that public institutions grant access to “environmental information” and allow “public participation in environmental decision-making.” However, neither Centerra nor the EBRD are legally bound by the convention, unlike Kyrgyzstan which acceded to it in 2001. Fidanka Bacheva-McGrath, a representative of the Prague-based watchdog group CEE Bankwatch, told The Diplomat that the EBRD’s “environmental and social policy requires that stakeholder engagement should be carried out bearing in mind the spirit, guiding principles and ultimate goals of the (Aarhus) Convention. According to this policy, compliance with relevant national law is an integral part of all Performance Requirements towards the EBRD’s clients.” She added: “The EBRD usually delegates the responsibility for information disclosure to its clients, even when it is clear, as in the case of Kumtor, that the company’s disclosure practices are not addressing the needs of the affected communities and the public.” The EBRD ranks lowest among multilateral development banks on the International Aid Transparency Index as of 2014. Centerra has maintained for years that it strictly abides by local laws and international standards in managing the Kumtor mine. The Canadian company has hired a number of international firms over the years to prove its compliance with environment protection practices. In response to an independent investigation attempt in September 2011 by Kyrgyz environmentalists CEE Bankwatch and hydro-geologist Dr. Robert Moran, Centerra employed Prizma LLC to counter the report, which highlighted the negative implications of the mining operations on the glaciers surrounding Kumtor. Unsurprisingly, Prizma LLC concluded that “climate change is a major cause of melting and retreat of glaciers around Kumtor,” citing relevant studies from the World Bank and U.N. It is undeniable that climate change is one of the main factors contributing to the melting of the polar ice caps and glaciers throughout the planet, but Centerra and its contractor Prizma LLC failed to identify the specific mining effects on the Davydov and Lysyi glaciers, given the company’s long-standing practice of dumping waste onto the ice sheet. This has further exacerbated tensions in the Kyrgyz Republic over disclosure of these facts to the broader public. Ryskeldi Satke is a contributing writer with research institutions and news organizations in Central Asia, Turkey and the U.S. Contact e-mail: rsatke at gmail.com. Franco Galdini is a freelance journalist and analyst.